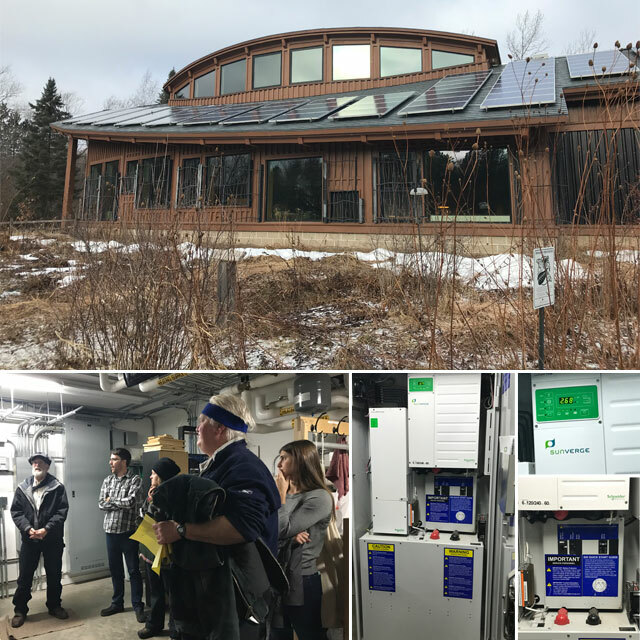 On Tuesday, December 5th nearly 30 hardy Minnesotans ventured out on one of the first really cold days of the season to join Northeast Clean Energy Resource Team (NE CERT) to learn about the solar plus battery storage project at Hartley Nature Center. While solar and storage are frequently discussed, there are few examples up and running in Minnesota that one can actually visit and learn from. Not only that, there are even fewer such systems that are done as retrofits to older solar arrays. Hartley’s project is an excellent example of both! What is Hartley Nature Center all about? Hartley Nature Center is an environmental learning center that hosts a pre-school as well as numerous kid summer camps and adult educational forums (such as this Regional CERT Meeting!). As a center designed around environmental education, this energy project falls right within the sweet spot of their mission. Indeed, many of the folks involved with the project have either grown up in and around Hartley or with kids attending Hartley activities. 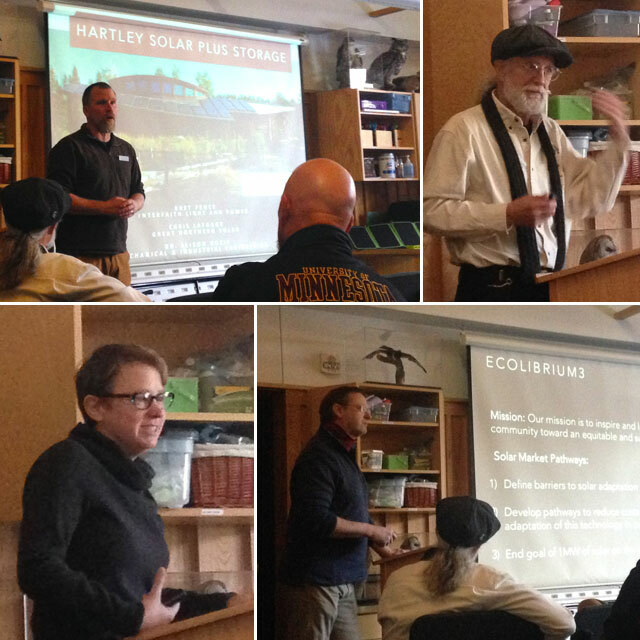 The event was hosted by Brett Amundson of the Hartley Nature Center who was joined by several other project partners to give an overview of their innovative project. Presenters (pictured below) included Bret Pence, formerly of Ecolibrium 3 and now of Minnesota Interfaith Power and Light, Christopher LaForge of Great Northern Solar, and Dr. Alison Hoxie of University of Minnesota Duluth’s Mechanical and Industrial Engineering Department. For all of the specific numbers and lots of detail, please review their joint PowerPoint below, or click here to download a copy. Oh, the power was out? Who knew! Brett Amundson shared one story demonstrating how storage can work. This past autumn Hartley had their first power outage since installing the system. However, they didn’t even know the power had gone out because most everything remained powered up—the preschool’s lights, the Executive Director’s computer, and other essential energy uses! The things with power were all part of the systems that had been put on the critical load panel—things deemed most important to keep up and running during a power outage. Identifying critical loads is an important part of any storage project, because it can help you appropriately size the system and avoid the expense of having to power everything. Testing and tweaking: One of the partners in the project has been the University of Minnesota Duluth. Led by Professor Alison Hoxie and her students, the UMD team has been working on optimization of the battery system and how to get the most out of the system to mitigate against peak demand charges. They have set points to keep the battery in its sweet spot and never fall below 20%. They’ve been doing experimentation with the optimization to see how they best “put it to work.” During that testing though, they’ve also been able to uncover some crucial operating rules, like ensuring that if the battery gets down to 20% at the end of day that it recharges with grid power overnight. What are your goals with the project? If savings money is your primary motivator, think about what loads you’re trying to offset. For commercial facilities, the biggest payback will come from curbing demand charges. When thinking about paybacks… consider the life of the invertor and life of the batteries. In the case of the Lithium-Ion batteries used at Hartley, the batteries have a warranty in terms of years and cycles. Consider what your replacement costs might be as you think about the project economics. What are your critical loads? What really needs to be powered? Alison mentioned this helpful tool from the National Renewable Energy Lab (NREL) to analyze sizing a system to meet those critical loads. Really look at what battery system components you need and the software tools that come with it; how are those supported and how much are you responsible for monitoring and controlling? Get partners involved early on in a project. Early engagement can ensure that partners are able to navigate competing needs and interests in moving a project forward. More work is being done on this topic, so if you’re just getting started, don’t feel like you need to go it alone. Alison mentioned a German Exchange Student’s work on a Duluth resiliency study looking at the development of a concept for a hybrid energy system for the water distribution and supply infrastructure in the City of Duluth as another good resource. Watch the final presentation on that project here. Shout out to partners and funders! This project’s success is due to the involvement and willingness of all partners involved to work through the various technical challenges and design decisions, and secure funding and in-kind support. Project partners included: Hartley Nature Center, Ecolibrium3, University of Minnesota Duluth, Great Northern Solar, Minnesota Power, and the City of Duluth. Funding support was provided by: University of Minnesota Northeast Regional Sustainable Development Partnership (the first seed money in to support the project), US Department of Energy Solar Market Pathways, Minnesota Power Foundation, Clean Energy Group (to support making this a training effort with paid instruction), and substantial in-kind contributions from the City of Duluth (specifically for electricians), and many others! Learn more! Click here to read a case study on Hartley Nature Center’s Solar Battery Storage, written by Sarah Galbraith, Clean Energy Group. You can also click here to read more about Hartley Nature Center’s educational work.